This book is based on the findings of a long-term (2000-2014) interdisciplinary research project of the University of Hohenheim in collaboration with several universities in Thailand and Vietnam. 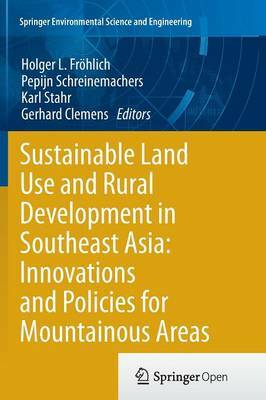 Titled Sustainable Land Use and Rural Development in Mountainous Areas in Southeast Asia, or the Uplands Program, the project aims to contribute through agricultural research to the conservation of natural resources and the improvement of living conditions of the rural population in the mountainous regions of Southeast Asia. Having three objectives the book first aims to give an interdisciplinary account of the drivers, consequences and challenges of ongoing changes in mountainous areas of Southeast Asia. Second, the book describes how innovation processes can contribute to addressing these challenges and third, how knowledge creation to support change in policies and institutions can assist in sustainably develop mountain areas and people's livelihoods.